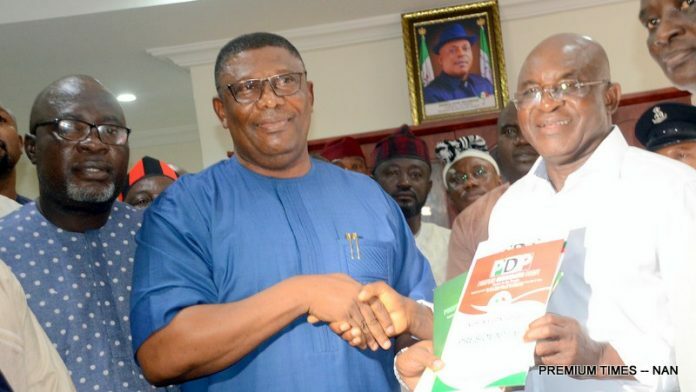 OrderPaperToday- A former two-time President of the Senate, Senator David Mark, has joined the list of people seeking to lead the country come 2019. Following his announcement and subsequent purchase of a nomination form yesterday, it is important to examine Senator Mark’s track record in the Senate since 2015. In a special report last year, David Mark scored zero points on the list of active Senators in the 8th Assembly. For this reason, he was placed on the list of benchwarmers in the upper legislative chamber, with only one bill to his name where he sought to establish a Federal University of Health Sciences in Otukpo, Benue State. The bill was passed for third reading on the 6th of July 2018. Reviewing his engagements since then, Senator Mark has improved a little in his contribution to discourse on national issues. Notably, he has been more active in issuing press statements through his Media assistant, Paul Mummeh, than he has been on the floor of the red chamber. The Benue Killings, where hundreds of Nigerians were murdered as a result of clashes between herdsmen and and farmers in Benue State, drew attention to the deplorable level of security in the country. Unlike Senator George Akume who was initially silent on the issue, Senator Mark immediately released two press statements calling for peace and vowing to bring perpetrators to justice. Away from his usual quiet demeanour in the chamber, on the 16th of January Senator Mark proposed a devolution of power, the creation of cattle colonies and an establishment of state police as solutions to the Farmer-Herdsmen clashes. Concerning important statements made during plenary, Senator David Mark has been on record decrying the current state of education in the country. He noted that universities were churning out poor quality graduates as a result of insufficient funding and bad management. He did this while contributing to the debate on the equitable distribution of federal tertiary institutions across the country. Furthermore, he also spoke notably on the flooding in Benue State, lamenting with his people and urging the federal government to ease the burden that disastrous floods place on his State every year. Finally, Senator Mark has been vocal in celebrating and memorialising his colleagues and elder statesmen, showering encomiums during the birthdays of past presidents, giving eulogies and commemorating festive celebrations, through press statements. Noting all of his recent contributions in the 8th Assembly, one must work out whether or not this is enough to support his presidential ambition.